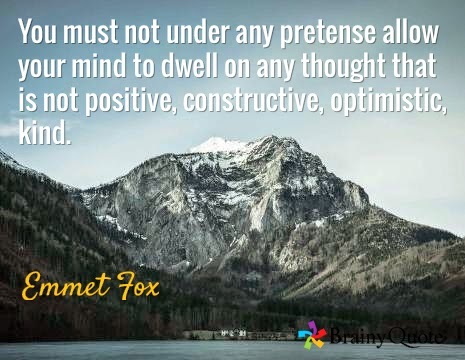 I’ve liked this quote from Emmet Fox ever since I first read it several years ago. It may seem odd, but a local pastor first mentioned Fox to me about 10 years ago. Most pastors do not quote from Fox, but many have read his work. Fox was an early source of inspiration for AA and routinely preached to thousands in halls around New York City each week during the great depression. Much of his work is outside of orthodox theology, some is far outside the mainstream, but I find the quote, above, to be very Biblical. What comes out of a man (words) defiles him (Mark 7:20-22). What we hold in our hearts, these are our true prayers because God knows them and we speak to him with our real beliefs, not our hollow words. You can speak good things all day, but if you hold evil in your heart, God is not fooled. As I begin my day, here’s 12 scripture verses about your heart and your thoughts. If you need a verse to meditate on for the morning, maybe one of these will help. If you do this, you will experience God’s peace, which is far more wonderful than the human mind can understand. His peace will guard your hearts and minds as you live in Christ Jesus. You are the ones who justify yourselves in the eyes of others, but God knows your hearts. This quote and these verses came to mind this morning. Part of my Lent experience this year is to dwell upon better thoughts. Specifically, I gave up slacker time in the morning to write daily, begin in prayer, exercise daily, and have a conscious effort to dwell on good thoughts, look for the good in others, and speak something positive each day. It has been the most difficult Lent season ever for me even though I gave up coffee one year and burgers last year. Hopefully, it will also be the most rewarding Lent as well.